What do you have to say about Chabad? "I really want to thank you for everything you have done for the community of Oberlin and for building a jewish community there that i can comfortably call home. I really really appreciate that." "Chabad provides a different atmosphere than any of the other groups on campus. On Friday nights, knowing that I'll be sitting around a dining room table, singing and eating with my friends, in a cozy, home-like setting, makes the stressful parts of my week disappear. There's a warmth at Chabad that is truly welcoming to all denominations of Jews, and the family who runs the Chabad House are some of the most caring individuals on this campus. Chabad strengthens the community aspect of Judaism, and creates an atmosphere of comfort that everyone can enjoy. " While at first Chabad functioned as a place to have a great Shabbos meal with my friends, I now feel that it has much more meaning in my life. When I left for college, I was afraid that I was going to lose touch with my Judaism, but after a week at Chabad I realized that this was not going to be the case. By addressing the weekly Torah portions, reciting the Shabbos prayers and sharing our inner thoughts about the weekly questions the Rabbi asks have helped me find a balance between the aspects of Judaism I have always known and the traditions that are completely new to me. Furthermore, I have never met a kinder, more welcoming and more hospitable family than the Elkans and I will never forget the first time I met them and how warmly I was received. Chabad is truly one of my favorite aspects of the Oberlin community and I feel so lucky to be a part of it. I thought that at college I would have to live without regular lively, thought-provoking, delicious Shabbat dinners. However, Chabad fills that void, and then some. I look forward to each Friday night meal at Oberlin just the same--if not more--than I used to look forward to Shabbat dinner at home because I know I'll be at Chabad. Chabad has the same cozy, intimate family-oriented feeling that I am used to for Shabbat, and the Elkans provide an extremely comfortable, hospitable environment for all who want to join. I continue to go to Chabad every Friday night because it simply feels like home. I go to Chabad to remind myself that true generosity and acceptance still exist. 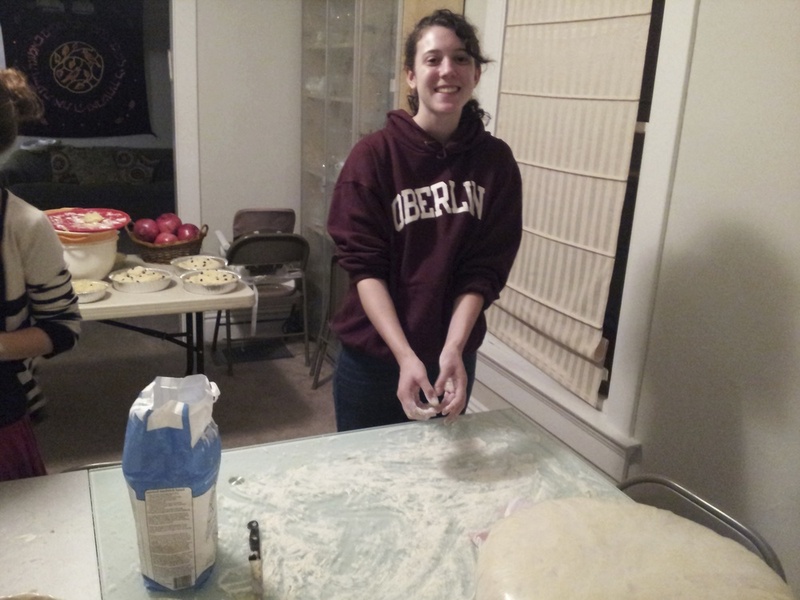 The Elkans go so far out of their way to ensure that the Jewish community at Oberlin always has a comfortable place to celebrate the holidays, a venue for philosophical and educational discussions on all of life's issues, and, of course, delicious shabbat dinner every week. This is a place where everyone can come together to celebrate, learn, or simply enjoy an evening in the company of good people. I feel a strong connection to Chabad because of how welcoming the Elkan family have been to me and my friends. Dinners every friday night have been more than a religious experience and a great meal, it has become a second home. I have never felt a strong connection to Jewish organizations, as they have a feel of a summer camp, which I've never really been able to relate to. But through Chabad I've been able to build my connection to my religion more than I ever thought I would.